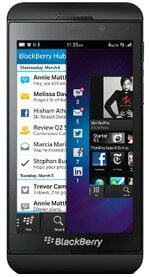 The BlackBerry Z10 is the first handset from RIM — now renamed simply ‘BlackBerry’ — running its much-anticipated BlackBerry 10 operating system. The 4.2-inch touchscreen device, announced on 30 January 2013, supports NFC. The Z10 contains an NFC controller from Inside Secure with an integrated secure element, offering the possibility of BlackBerry branded secure NFC services in the future. A keyboard-equipped version of the phone, known as the BlackBerry Q10, was also announced and is expected to be available from April 2013. The BlackBerry Z10 was widely referred to as the L-series ‘London’ before its launch.